Has the BBC Changed Its Podcast Policy? One of my favorite radio programs is the BBC’s “In Our Time”. Every Thursday, except for a summer break, Melvyn Bragg and three varying and eloquent academic experts discuss what in Swedish would be called “idéhistoria”. Besides pure history, the program takes up the history of science, philosophy, religion, and culture. Recent programs have taken up the Spanish Armada, imaginary numbers, and the Neanderthals. What is frustrating is that only the program from the past week has been available as podcasts. This is especially odd as several years of programs are archived for online listening, on-demand. Which means that anyone can play the files and record them as mp3 files. Having done this several times I can confirm it can be done, but is very time-consuming. And programs going back to 2002 can be downloaded from the Pirate Bay. 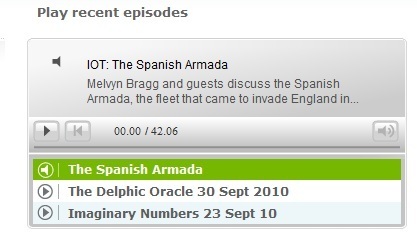 So the lack of a podcast archive on the BBC website has been hard to understand. Especially since the nature of the program means there can’t have been rights issues. Hopefully this signals a change in policy at Broadcast House. It would be nice if the back archives could also be made available, but this is great news!